• Last season, playing for one of the worst defenses in the country, Jamon Hughes emerged as a star. Consider how well a linebacker must play to earn first-team all-conference honors for a team that allows an average of 39.8 points per game. Years from now, will Tiger fans remember Hughes and his 147 tackles (the most by a Tiger in 30 years)? The sad truth is that rare jewels from 1-11 seasons tend to gather dust. Be sure and watch Akeem Davis over the next two months. Listed on the depth chart as a linebacker but built like a safety (6-1, 200), the junior from Laurel, Mississippi, appears to be this season’s Jamon Hughes. Through four games, Davis leads Memphis with 26 unassisted tackles and is second to Terrence Thomas in total tackles (34). Against SMU last Saturday, Davis forced a fumble, recovered two fumbles, and intercepted a pass by Mustang quarterback J.J. McDermott. In many respects, Davis may personify this year’s Tiger defense: undersized, with his primary talents being heart and effort. • Where does a team that has suffered three blowouts focus on improvement? Larry Porter would do well to look at his offensive line. Since rushing for 164 yards in the opener against Mississippi State, Memphis has averaged 60 yards over the last three games, including a woeful -14 against SMU. While quarterback Taylor Reed wasn’t sacked against Austin Peay, he went down five times against Arkansas State and four times last Saturday. Porter uncharacteristically singled out freshman center Monte Golden for his struggles against the Mustang pass rush. Golden was forced into duty after injuries to the Tigers’ top two centers. Whether or not first-string center A.J. Antonescu is back in the lineup Saturday (or second-stringer Chris Schuetz), Memphis has an inexperienced offensive line, with senior Ron Leary (at left tackle) the only true veteran. As dreadful as the first month of the season has been for the Tigers on the scoreboard, the rest of the season could be just as ugly without improvement from this unit. • The Tigers face Middle Tennessee this Saturday. 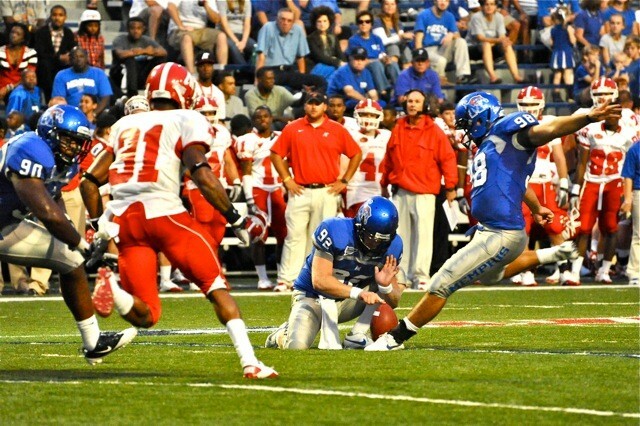 Rest assured, the Blue Raiders know they were the only team to lose to Memphis last season. Needless to say, this is not a regional gimme (Middle won the two previous meetings with the Tigers since the series was renewed in 2007). The Blue Raiders are near the bottom of the Sun Belt in total defense (498.3 yards per game) but near the top in total offense (461.3). They were blown out by Georgia Tech, but lost by three points on the road to Purdue and Troy. It’s a state of where the Tiger program currently sits, but this is a big game. A win would ensure improvement over last season’s 1-11 finish. 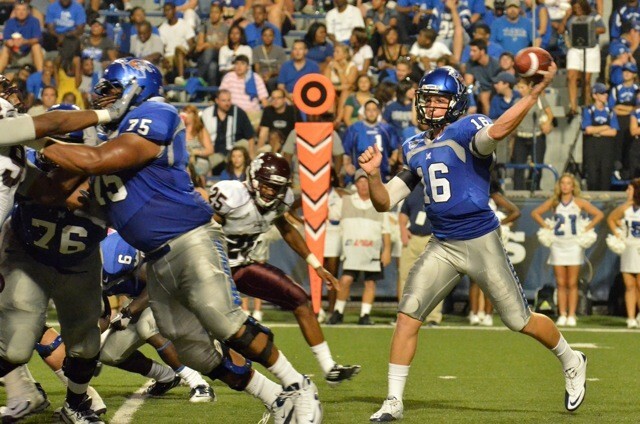 A win would create the opportunity for Memphis to even its record on October 8th at Rice. And, of course, a win would be the team’s first over a Football Bowl Subdivision team. Huge game. Perhaps SMU is the model. As recently as 2007, the once-proud Mustang program was 1-11. A year later, under a new coach (June Jones), SMU again finished 1-11. But in 2009, the Mustangs tied for first in Conference USA’s Western Division and finished a respectable 8-5. This afternoon, they came to the Liberty Bowl as C-USA’s reigning Western Division champs and steamrolled the Tigers, 42-0. The SMU offense was more clinical in its dominance of the Memphis defense than were Mississippi State and Arkansas State in earlier blowout wins over the Tigers. Instead of big plays, the Mustangs drove the field steadily behind junior tailback Zach Line and senior quarterback J.J. McDermott. Line scored the first of three one-yard touchdowns with just under three minutes expired (he now has a nation-leading 11 rushing touchdowns in four games). McDermott passed for 357 yards and three touchdowns, the biggest a 44-yard strike to freshman Der’rikk Thompson with 7:01 left in the first half to give SMU a 28-0 lead. Billy Foster . . . surrounded. The Memphis offense was overmatched, both on the ground and in the passing game. The Tigers carried the ball 24 times for a net loss of 14 yards on the ground (counting four sacks of Memphis quarterback Taylor Reed). The longest carry of the day was an 8-yard run by Billy Foster. Freshman center Monte Golden — third on the team’s depth chart — was forced to start because of injuries to A.J. Antonescu and Chris Schuetz. And the inexperience showed. “We had a horrible day offensively,” said Porter. “[Taylor Reed] is young, but he has to play better. And he needs help from the players around him.” Late in the first half, Reed completed a 46-yard pass to freshman Keiwone Malone down the left sideline, a play that gave the Tigers a first down at the Mustang 10-yard-line. A Foster carry gained nothing, though, and three straight incomplete passes by Reed gave the ball back to SMU with a zero still on the scoreboard for the home team. Reed completed 17 of 32 passes for the game, good for only 153 yards. The leading rusher in C-USA, Line finished the game with 136 yards on 20 carries. Darius Johnson caught 10 passes to lead SMU with 116 yards. “It’s one mistake after the other,” said Porter. “Freshman center, freshman quarterback, two freshman receivers [Malone and Kevin Wright]. Even if we have to bleed and grind yardage, that’s okay. As long as it’s positive and gives us an opportunity to move the chains and sustain drives.” Memphis had only seven first downs (compared with 27 for SMU) and punted the ball 12 times, one shy of the record for the Tiger program. “All four quarters, the attitude of our defense was phenomenal,” said Porter, grasping for a positive. “We had some guys I wanted to pull late in the fourth quarter, but they said no. And that says a lot. They did some solid things despite us not being able to do anything offensively.” Junior linebacker Akeem Davis recovered two fumbles and had an interception, while senior linebacker Terrence Thomas led Memphis with 13 tackles. Now 1-3, the Tigers will play four of their next five games on the road, starting next week in Murfreesboro against Middle Tennessee (the only team the Tigers beat in 2010). SMU now finds itself 3-1 overall, 2-0 in Conference USA play. Quite possibly the program Larry Porter and staff should be aiming to emulate. • Peay-sized measuring stick? — For a football team suffering an 11-game losing streak, any victory over a group of men in different uniforms is big. Contrary to what you read about the legends, athletes aren’t born winners. They learn how to win. The Tigers have only five players with as many as 10 career starts. This is an inexperienced team coach Larry Porter is fielding, one that desperately needed a booster between the ears. And the win over Austin Peay provided it. But can we measure progress (beyond the mental variety) in the Tigers’ beating a Football Championship Subdivision squad? In its opening game of the season, Austin Peay surrendered 72 points and 387 rushing yards to Cincinnati. Memphis scored 26 points and ran for 113 (on 33 carries). The Governors gained 277 yards against Cincinnati, then 368 against the Tigers. This may simply serve as a barometer for how the Tigers would fare against the Bearcats. (Cincinnati beat up on Akron last weekend, 59-14, a week after losing by 22 to Tennessee.) This Saturday, Memphis will host an SMU team that ranks second in C-USA in passing offense (309.3 yards per game) and second in total defense (296.7). Not all that promising for a U of M team that ranks 11th in the league in passing defense (318.7) and 8th in total offense (317.3). All that said, we’re merely three games into the season. If you’re in the Tiger locker room Saturday morning (kickoff is at 11 a.m.), those numbers are worth the paper they’re printed on. • The announced attendance at last Saturday’s game was 18,808. Whether or not that represented the number of people in the stands, the turnout was larger than I expected. I’ve certainly seen Tiger football games with smaller crowds. And I think this speaks well for a beleaguered program, one that has some climbing to do before it regains regional (to say nothing of national) respectability. I’m guilty of joking in the press box about game-day elbow room at the Liberty Bowl. (The stadium’s too big; that’s no joke.) But the fans who turn out to see a team that has been outscored 106-17 over its first two games — a team hosting a school that played club football a decade ago — are a breed to be respected. Admired, even. And these fans have friends and colleagues. In other words, Memphis Tiger football does indeed have a fan base. When the wins return, so will the energy in the stands of that gargantuan stadium. • Why, oh why does the U of M not display the names and numbers of the four football players who have had their jerseys retired? This weekend is homecoming, an annual salute to alumni (and former players). On Friday, the M Club will induct its newest class to the school’s Hall of Fame. (One of the inductees will be Isaac Bruce, one of the four football players to have their jersey retired.) But to the best of my knowledge, the only way you can see (or read about) these gridiron greats is if you own a media guide. Retiring someone’s jersey is the ultimate salute from program to player. Hiding that honor diminishes the gesture. A few gallons of blue paint can solve this problem. For the record, the Memphis football players you’d see honored by that paint: Dave Casinelli (#30), Charles Greenhill (#8), Isaac Bruce (#80), and DeAngelo Williams (#20). MEMPHIS, TENN. —- Elma Neal Roane, who was the foundation of women’s athletics at the University of Memphis, passed away at 6 p.m. on Monday evening following a long illness. She was 93. Visitation will be held in the main gymnasium of the Elma Roane Fieldhouse on the U of M campus on Thursday from 4 p.m. — 7 p.m. Funeral services for Ms. Roane will be held Friday at 1 p.m., at Memorial Park Cemetery located at 5668 Poplar Avenue. A 30-yard field goal by Paulo Henriques gave Memphis a 10-0 lead at the half, then a bit of good fortune helped the Tigers take a commanding lead early in the third quarter. Reed connected with tight end Andrew Ena-Ita with a pass across midfield, only to watch Ena-Ita fumble the ball when hit deep in the Governor secondary. To the rescue, though, came freshman wideout Kevin Wright, who picked up the loose ball and scampered 22 yards for a touchdown that gave the Tigers a 17-0 advantage. Foster’s numbers jumped off the stat sheet as well, with 62 yards on the ground and 118 via four catches. Marcus Rucker caught six passes for 64 yards before leaving the game in the third quarter after being kneed in the back. On the defensive side of the ball, linebacker Akeem Davis had 10 solo tackles for Memphis. After giving up more than 600 yards against both Mississippi State and Arkansas State, the Tiger defense held Austin Peay to 368 yards and picked off a pair of Jake Ryan passes (by Lavaris Edwards and Taurean Nixon). NOTES: The Tigers played the majority of the game with their third-string center, freshman Monte Golden, after today’s starter, Chris Schuetz left the game with a leg injury. 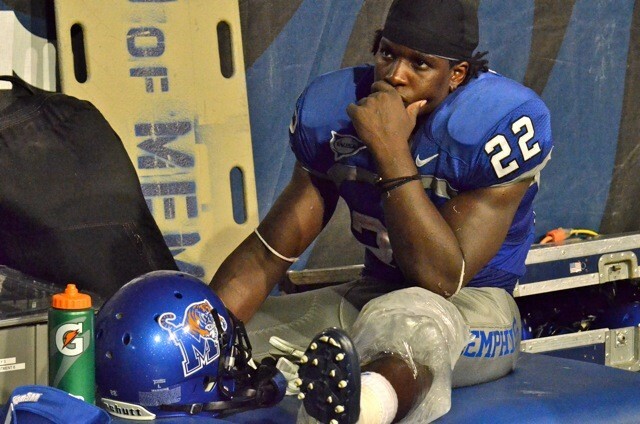 • Porter said he does not anticipate tailback Jerrell Rhodes returning for the SMU game. Rhodes suffered a knee bruise in the opening game of the season. • Tonight was the first time Memphis has scored 20 points since its last victory (over MTSU) on September 18, 2010. There are more than 80 players on a college football roster. Most of them don’t make an impact on the field until their third season on campus (often including a redshirt year). Larry Porter’s challenge is greater than that of a basketball coach, who can turn his program around immediately with a single strong recruiting class. To Porter’s credit, he’s sending a team on the field these days with many of his own recruits, however raw their talents may be. And yes, those recruits are getting clobbernockered. Dismiss Porter, and this leaking ship is still a leaking ship, just with no direction. A point would be made (that the administration is impatient), but little gain would be realized. 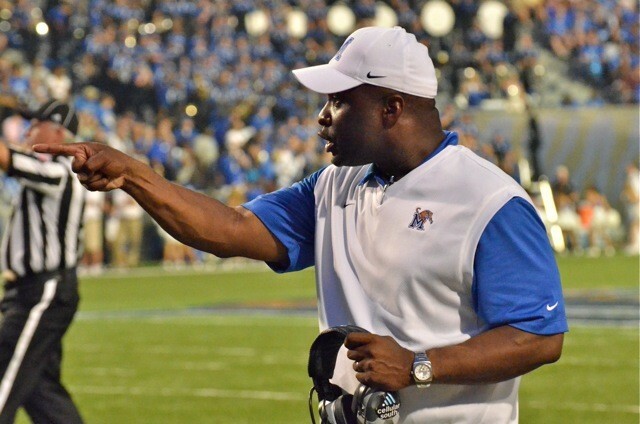 • “Fire the A.D.!” — By many measures, the University of Memphis has a tremendously successful athletic department that has been steered, for 15 years now, by R.C. Johnson. The baseball team plays in a new ballpark and produced the 2010-11 Conference USA Athlete of the Year. Both soccer programs win every fall, and the women’s team may contend for a national championship at its current pace. (A coincidence that these teams play in a still-new stadium named for one of the university’s most prominent boosters?) In terms of fundraising, more than 40 people have donated at least $500,000 to the athletic department (it’s called the Ambassador’s Club). That’s the kind of money that will pay for a recruiting trip or two. And I haven’t even mentioned the men’s basketball program, still the flagship sports entity for the entire city. But . . . it’s all about football. Whether or not this is healthy depends on how seriously you take your fall Saturdays. (My colleague Greg Akers has an opinion on the matter.) The U of M never joins a big-ticket conference without a successful football program. And whether success is measured by 10-win seasons or second-tier bowl games, it’s certainly not measured by 40-point losses to teams from the Sun Belt Conference. If you measure R.C. Johnson’s performance as athletic director by the progress his football program has made since 1996, he’s failed. When or if a change is made to dramatically shift the focus and direction of the program, it will include Johnson’s departure. • “Fire the president!” — It’s a shame Shirley Raines went public with a letter summarizing the priority football remains in her office. As the university’s CEO, it’s not her responsibility to field a winning football team (or field any football team at all, for that matter). Dr. Raines should keep her focus on hiring the best economics professors, equipping the chemistry labs with the latest in technology, making sure the school’s endowment figures parallel those of similar public institutions across the country. The only time a college president’s name should appear in the same paragraph as the football team should be when (or if) a new conference affiliation is announced. (Or when she fires an athletic director.) Tiger football fans have every right to scream at the head coach and athletic director. Decisions they make yield the results we all see on those fall Saturdays. But unless you’re an academics booster with your checks going toward institutional development, leave criticism of the university president at the turnstile. The Tigers traveled to Jonesboro today with hopes of easing fears. After a 45-point thumping against a Top-20 team from the mighty SEC to open the season, Memphis would face an Arkansas State team expected to finish in the middle of the Sun Belt Conference pack. There’s much to fear. The Red Wolves gained 336 yards and a 27-point lead by halftime in what would be a 47-3 drubbing of the Tigers. Memphis has now lost a program-record 11 straight games and failed to score as many as 20 points in any of them. Freshman quarterback Taylor Reed made his first start for the Tigers but won’t remember today’s affair any more pleasantly than his debut in relief of Andy Summerlin against Mississippi State. Reed completed 13 of 28 passes for just 84 yards (none of his completions made it as far as 20 yards downfield). Billy Foster started at tailback in place of the injured Jerrell Rhodes but averaged only 3.2 yards on 14 carries. Freshman Artaves Gibson was no better, picking up 39 yards on 14 carries. 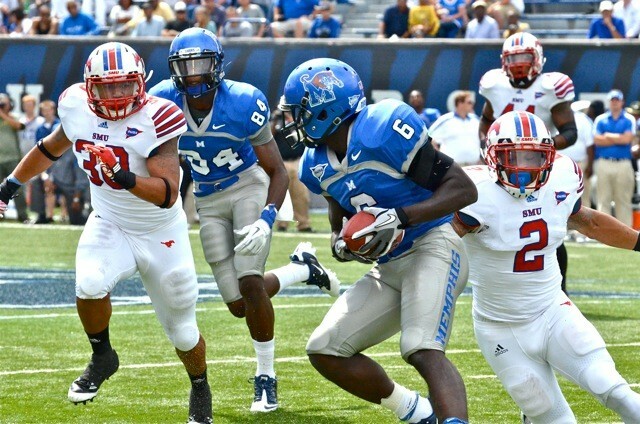 Overall, Memphis gained 165 yards (after compiling 338 yards in the opener). The Tiger defense yielded 614 yards (after allowing 645 against MSU). The Tigers were a woeful four of 16 on third-down conversions. A 71-yard touchdown pass from ASU quarterback Ryan Aplin to Josh Jarboe early in the second quarter looked all too similar to the five big-play scores Memphis suffered in its first game. Aplin threw for 274 yards and three touchdowns, with Jarboe on the receiving end of seven passes for 162 yards and two scores. The Red Wolves evened their record at 1-1. The Tigers return to the Liberty Bowl next Saturday to host Austin Peay, a team that enjoyed a bye week after losing to Cincinnati, 72-10, on September 3rd. The Tigers haven’t played the Governors on the gridiron since 1957, but own a 6-0 record against the second-tier program. Malone was able to avoid the standard season on the sideline because he transferred to Memphis in part to be near an ailing relative. His case is similar to that of former Tiger basketball star Elliot Williams, who played for the Tigers in 2009-10 after spending his freshman season at Duke. A four-star prospect at Mitchell High School, Malone caught 209 passes for 4,034 yards and 57 touchdowns as a prep Tiger. He immediately becomes one of the fastest weapons at the disposal of coach Larry Porter and freshman quarterback Taylor Reed. Marcus Rucker led Tiger receivers with seven catches for 73 yards in their season-opening loss to Mississippi State. • These SEC games have to stop. Pardon the broken-record here, but the annual beatdown (sometimes plural) at the hands of SEC competition is damaging the Tiger program, and severely. Since 1997, Memphis is now 2-25 against SEC competition. The Tigers have lost 11 straight, and the margins of the last six games are as follows: 17, 31, 28, 42, 36, 45. So not only is the gap in strength significant . . . it’s widening. Understand that athletic director R.C. Johnson is (presumably) trying to attract a bigger, better conference, one with Bowl Championship Series ties. So you do this by scheduling SEC competition? This is like an average Joe (or Frank) trying to land his dream girl by hanging out at a male modeling agency. The contrast doesn’t help. Making matters worse, the most recent drubbings have been at the hands of Ole Miss, Mississippi State, and Tennessee . . . second-tier SEC programs. All this in the interest of selling some extra tickets (to fans wearing opposing colors)? I assure you there were scores (if not hundreds) of fans at last Thursday’s game, willing to give optimism a chance, who will now make other plans for September 17th, when Memphis hosts Austin Peay. Stop this abuse, R.C. If any good came of Rhodes being lost, it was the early emergence of freshman Artaves Gibson. 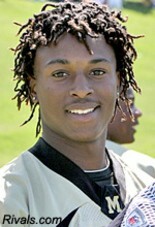 The Mitchell High grad carried the ball 17 times for 85 yards (5.0 average). Gibson’s size (220 pounds) would be a new kind of weapon for the Tigers. 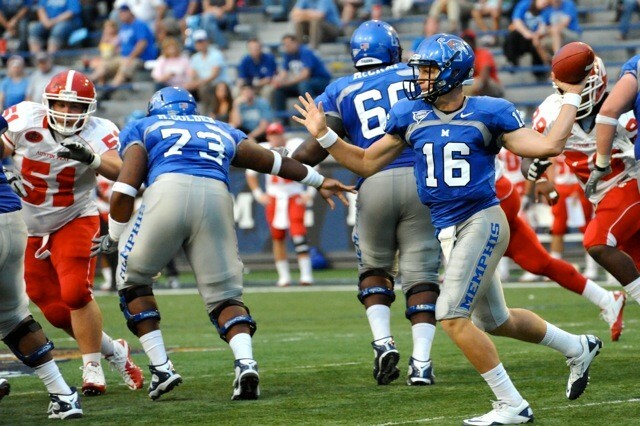 Combined with an immense offensive line, it appears Memphis might be able to grind away some lengthy drives. Troubling were the two fumbles by Billy Foster. He won’t be carrying the rock with any regularity if he can’t keep a grip. • The position of safety has its name for a reason. Players trusted with manning this position are there, primarily, to prevent the big play. They pick up receivers beyond the linebackers (or beaten cornerbacks) and they close on ball-carriers who manage to elude the first two lines of defense. Based on Mississippi State’s five touchdowns of at least 35 yards in the opener, Mitch Huelsing and Cannon Smith may not be the right tandem for this job. It’s unfair to judge any player on a single game, but I’ll be watching the safeties Saturday for signs of progress. If it comes — progress — you’ll see it on the scoreboard, too. These are the games where BCS dreams go to die. 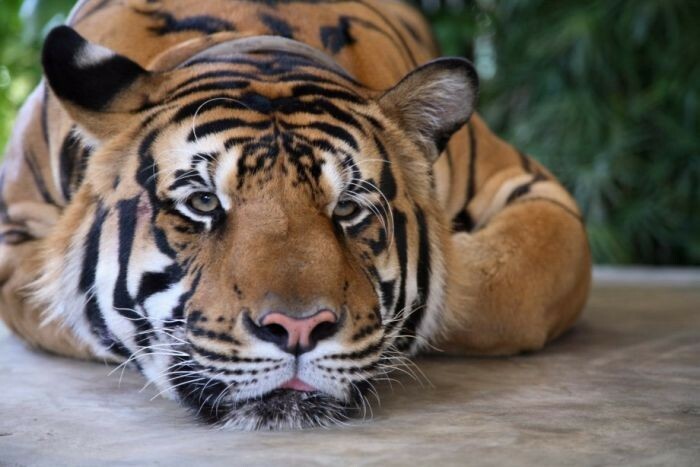 When Memphis Tiger faithful — football variety — ponder the possibility (however slight) of someday joining a conference with Bowl Championship Series benefits, the nightmare of losing (again) to an SEC program by 45 points inevitably displays how wide the gap remains between the BCS haves and the U of M have-nots. Injuries added to the insult of the final score. Starting tailback Jerrell Rhodes gained 28 yards on his first six carries of the season, then went down after a violent hit to his knee from the Bulldogs’ Corey Broomfield just two minutes into the second quarter. (Porter said the injury appears to be a hyperextension.) Starting quarterback Andy Summerlin injured his left ankle and was replaced in the second quarter by freshman Taylor Reed, who completed 23 of 35 passes for 149 yards and a touchdown pass to Marcus Rucker. Filling in for Rhodes, freshman tailback Artaves Gibson rushed for 89 yards on 17 carries. Porter emphasized that Gibson has earned playing time in the Tigers’ second game, September 10th at Arkansas State. A crowd of 33,990 had thinned by the time the game ended, more than three hours after kickoff. Many of those left, alas, were wearing maroon. 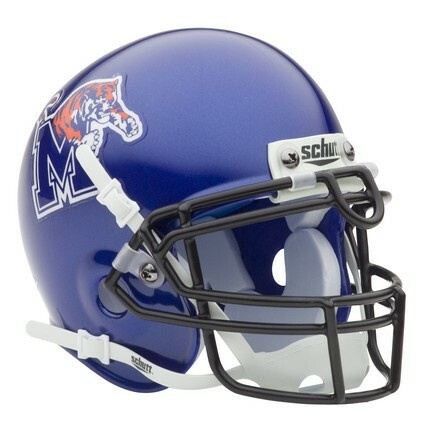 If there’s a silver lining, perhaps it’s the fact that this is the final SEC game of 2011 for the Memphis Tigers. The next three weeks will see the Tigers travel to Jonesboro, then host Austin Peay and SMU, all games that — not that long ago — would have been considered winnable for the U of M. Giving up 59 points and 645 yards to start a season, there’s only one direction to go. Right, Coach? Here we go. Aiming to top last season's winning percentage of .697 (67-29).